Anyone who lives along the Gulf Coast and the southern Atlantic Coast can easily see the value of clear hurricane shutters. Andrew, Charley, Frances, Jeanne, names that will make any Florida resident break into a cold sweat. There are still areas of Port Charlotte, Arcadia, and countless other communities recovering from those devastating storms. And, of course, the most recent Mother of All Storms: Katrina. The best way to protect the most vulnerable areas of a home, namely the windows, is with shutters. The standard hurricane shutter can come in galvanized steel, wood, plywood and other sturdy materials. But, they all have one negative aspect in common: a lack of transparency. Sitting inside a house that is literally being squeezed, stretched and nearly torn asunder by the very worst Mother Nature can offer is bad enough. To have to do it in a “cave” is downright terrifying. So it was that TPS, Inc. (Transparent Protection Systems, Inc.), among other companies, developed a clear window and door protection system. In the case of TPS, they created their ClearGuard hurricane panels. Based on extensive tests that were carried out in south Florida labs, it offers hurricane protection that meets the stringent national, state and county regulations. Made from the same powerful polymer that was originally invented for use in the canopies for jet fighters and car light lenses, it is as strong as any steel or aluminum panels. Yet, as it is virtually transparent (tests show it allows up to eight-five percent light transmission), the people inside are able to still see what is going on outside. Light, as is the light that allows us to see, is only one issue. There is also the matter of light as in weight. Normal storm shutters of steel and wood are quite heavy. In addition, they are also often big, bulky and difficult for one person to install. Aluminum shutters cut down on weight, but they have the problem of being easily bent during transport or while being stored between hurricane seasons. Polymer based shutters have none of these problems. While light weight and easy for anyone to put in place, a single band can deform, but they just as easily snap back to its true shape. 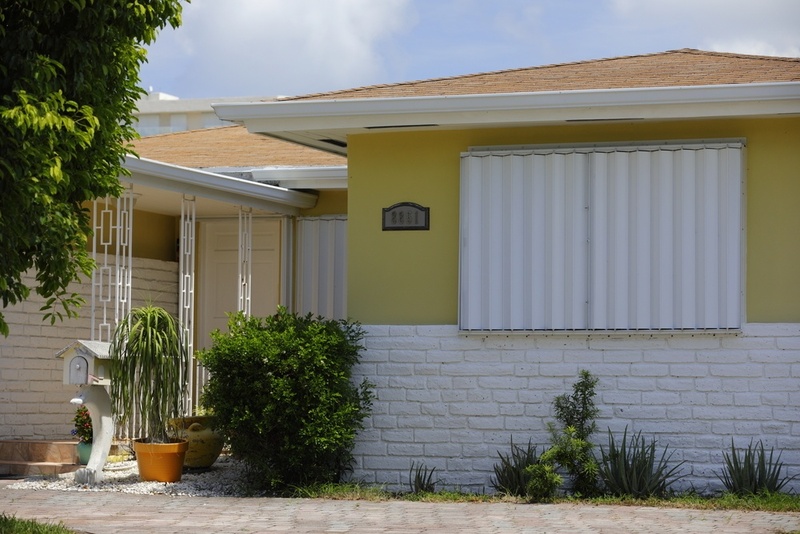 So, it is clear to see that clear hurricane shutters have several outstanding features to them.